Because stressing about the formatting shouldn't be delaying your job search. 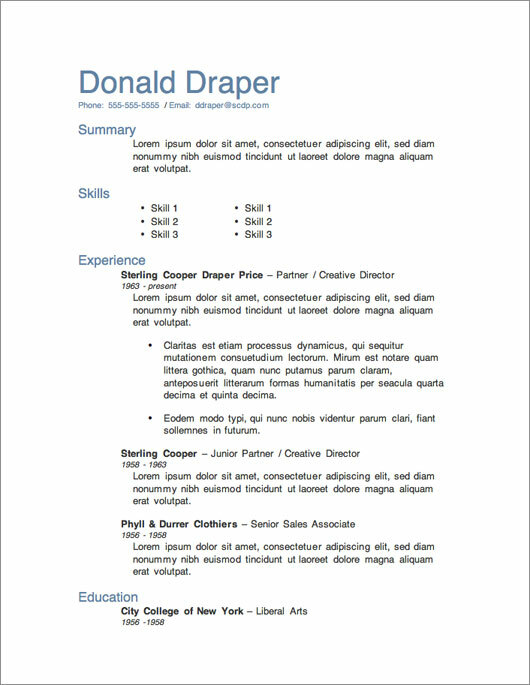 Instead get a jumpstart with these 12 free resume templates. I've written my own handful of resumes through the years and have talked to a ton of friends and Primer readers about the process. The number one complaint about looking for a job (which means using it to delay the process for months) is writing or updating a resume. A resume is short, fewer than a couple hundred words. Sometimes it's not even written in complete sentences. It's about a subject no one knows better than ourselves. And yet it's such a chore. 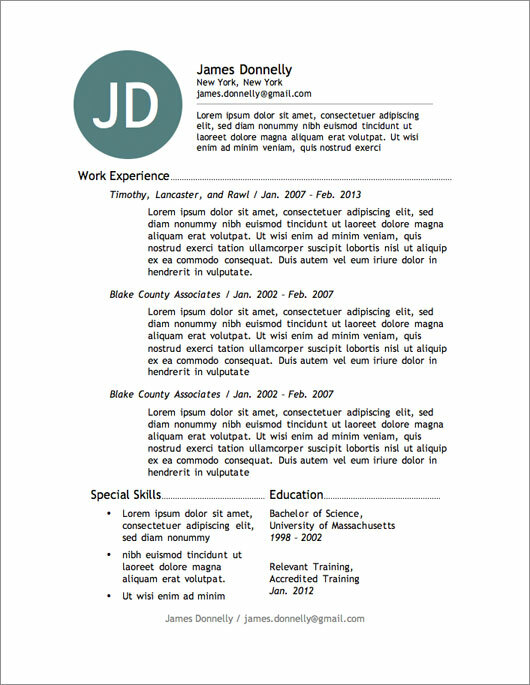 Perhaps the most frustrating thing about the resume writing process is formatting. Getting everything you need to say down and have it packaged neatly is a trial-and-error design challenge. You're a smart person, this isn't an unmanageable task, but this extra time could be used for the fruit-bearing part of the job seeking process like researching positions, having coffee with contacts, and connecting with others in your network. 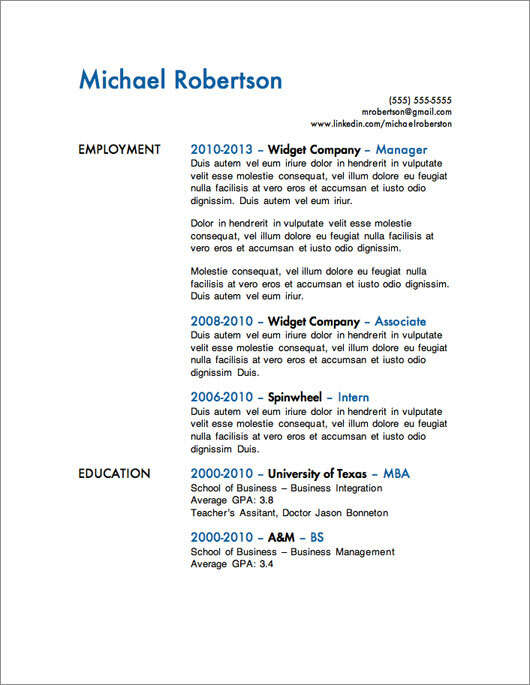 To help out, I've created these 12 Microsoft Word resume template designs free to download. 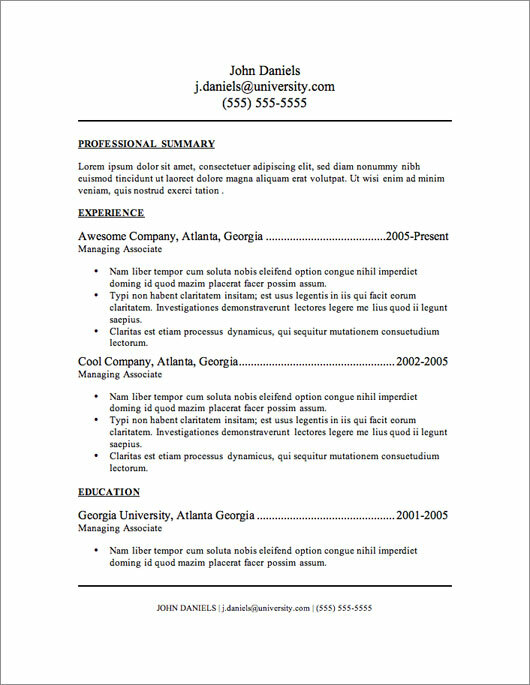 Differing in structure, style, and tone the resume templates should cover a wide variety of industries and positions for job seekers. 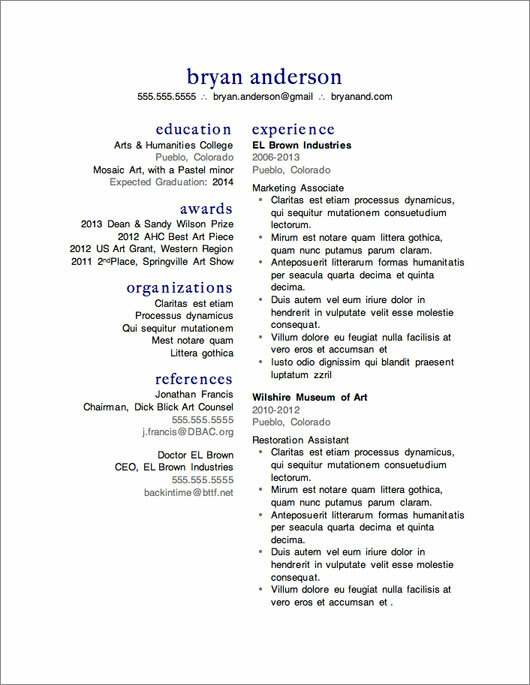 Find a template that makes use of white space for folks with limited job experience. If you've been at it for a few years, find a template that allows for greater detail of your previous responsibilities and experience. After you've picked a resume template it's time to get down to work on the truly important part: the contents of the resume. A resume designed by the world's best artist without the right content isn't any better than no resume at all. If you submit the same resume to every job you apply to, you're doing it wrong. There's no such thing as a one-size-fits all resume for every position, even for the same position at different companies. Create a master document, and modify it to reflect the interests of the specific company you're applying to. The job description is the secret to success. The employer is literally telling you what they're looking for, so apply your experience to the keywords they use. Ditch the “Objective” section. This is an outdated part that just takes up space. Everyone's says the same thing: “To have a rewarding and challenging role at an industry-leading organization blah blah blah.” Instead, create a Profile section. This is where you define yourself, work ethic, and experience in your own words. Your overall strengths and impressive accomplishments. Keep it short, no more than a couple of sentences. Don't describe the duties of your previous positions. If you're applying to be an accountant, the hiring manager already knows the duties of an accountant. Instead focus on highlighting your quantifiable contributions to the companies. Don't write “Monitored accounting and related systems for accuracy,” get specific. “Developed new workflows for analyzing accounting across departments that cut errors by 40%” is a specific contribution you made to your previous employer. It shows the kind of value you bring beyond the staple duties of the position. Keep it to one page. You may eventually get to the point where your resume will require more pages to list impressive clients or projects, but until then keep it readable with just one page. Provide more focus to your most recent position. Don't feel the need to detail the specifics of a job you had 5 years ago, since you likely had less responsibility and made less impressive contributions. If your most recent position has 4-8 highlights, use 2-4 for the older ones. Be objective with yourself: know when something is impressive and when it's not. If it reads just like a job responsibility, ditch it or reword it to showcase your expertise. 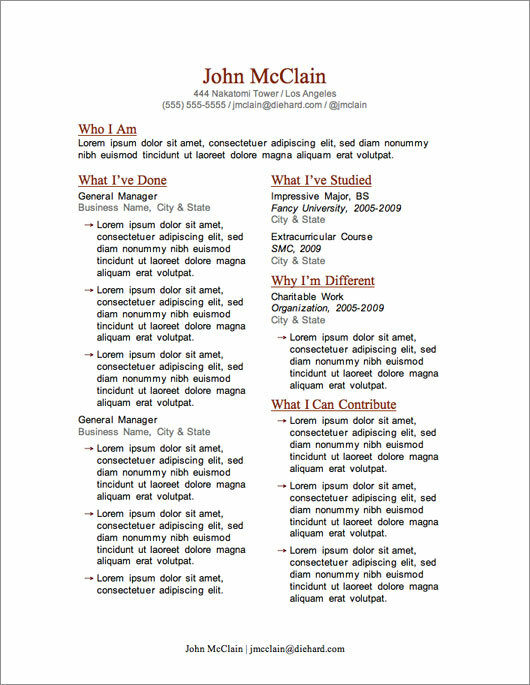 Note: These resume templates were created in and intended for Microsoft Word. The formatting may shift or break if used with other applications, though it should be easily modifiable to look correct. If the template looks different than the example it may be because you don't have the correct font. Simply find a similar one installed on your computer. All the best to you on your job search! 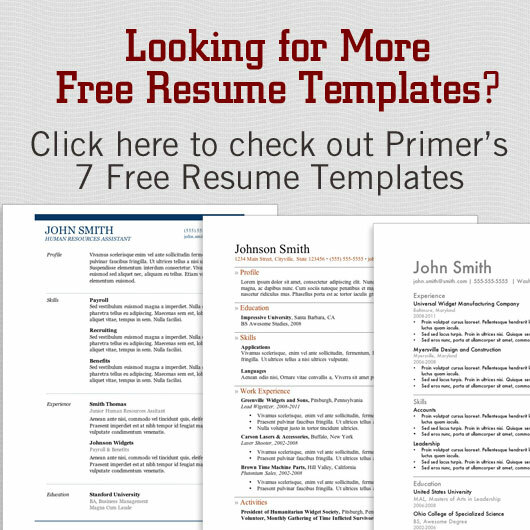 I hope you find my resume templates helpful. Sorry to be demanding but could you add a quick rundown of the pros and cons of each template? Or what you think it’s suited for. This is a great post, one page seems a bit light but I like the thought behind it. I’m still an undergrad in NZ and I find the hardest thing for CVs and interviews is to strike the right level of professionalism. Professional customs may be different in NZ regarding page length but consider the perspective of the person reviewing it. If they have 100 resumes to go through I can almost guarantee they won’t read beyond the first page. There aren’t universal pros and cons for each since everyones situation is so different. It’s really up to the priorities of the individual how much space they need and the design they feel is appropriate for their industry and position. Psyched and amazed that this came out today! I am applying for a promotion at work and have to send in my updated resume and cover letter tomorrow. The side article on cover letters is great too. I’m still deciding between the Donald Draper and the Michael Robertson. I work at a university so I want something that will stand out, while still upholding to the traditional standards I know my bosses look for and are comfortable with. As a warning, removing the Objective could really hurt you in old-guard fields and with large companies. I can’t imagine getting a proper interview without explicitly stating my intended position and role. The objective line is as much for HR to categorize you as it is for the interview to have a quick notion of what they should expect from you. If you work in a field dominated young professionals or one that requires displays of outward creativity, then it could be worth exploring the Summary over the Objective. A good point. For me, that info goes in the cover letter and in some form in the profile, relating your personal expertise the position you’re applying for. What about references? I have been told by careers advisors that leaving out references or adding “references upon request” is a bad idea. I’ve always been told that it’s assumed you will be able to produce references when called upon to do so, so there is no reason to state that you can. Helped me a great deal. 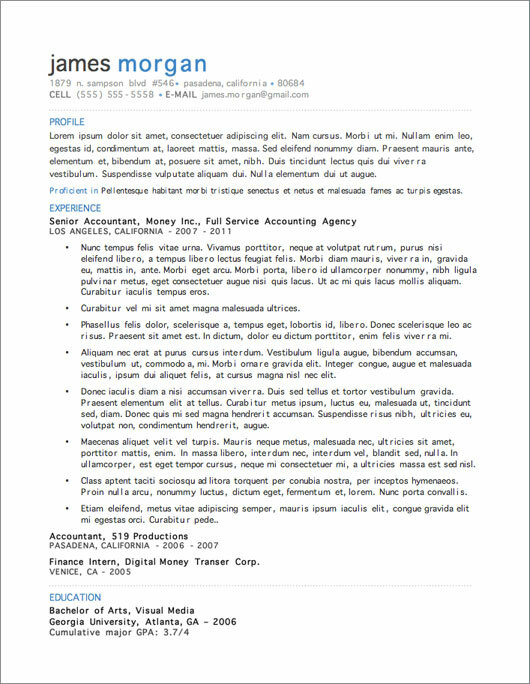 I had to apply for a new company and I was really worried coz my old resume was well OLD. But now it looks amazin’. Thanks man! Which template would you use for a individual with an IT background with 5-10yrs experience? Thanks so much for the templates!! I haven’t had to update my resume for a long time as I was a stay at home Mom. Was looking for some templates and a lot of them are terrible. These are great and will be a big help to me! These are some REALLY SWEET templates! Thanks alot! Thank you very much for the advice and templates – what a relief to have help making it look good. and put a dollar or Euro signs beneath them…. It should be in the footer. Go to View / Footer in your word processing program and you should be able to edit it. 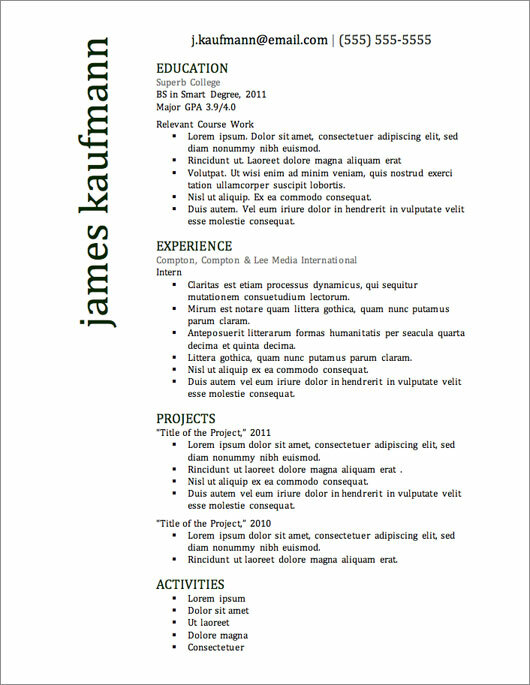 I like your resumes, but I personally prefer resumes that are more designed, like these ones http://www.cvfolio.com. I don’t know why my comments are not showing, is it broken? Thank you for these. Life saver as I update my resume today. Noticing you have only used male names… You do know women use resumes too nowadays? 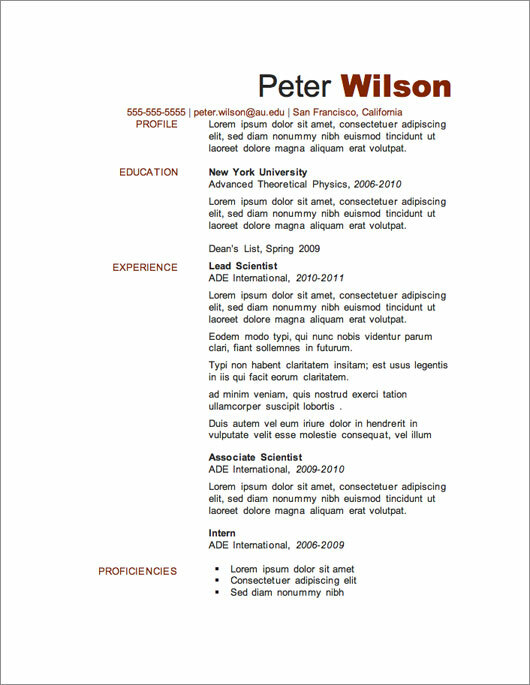 Thank you for sharing the resume format. It was very helpful. I am looking for the right resume for a seasoned professional with varied work experience transitioning from one field to another. Should I list my skills and then the jobs? 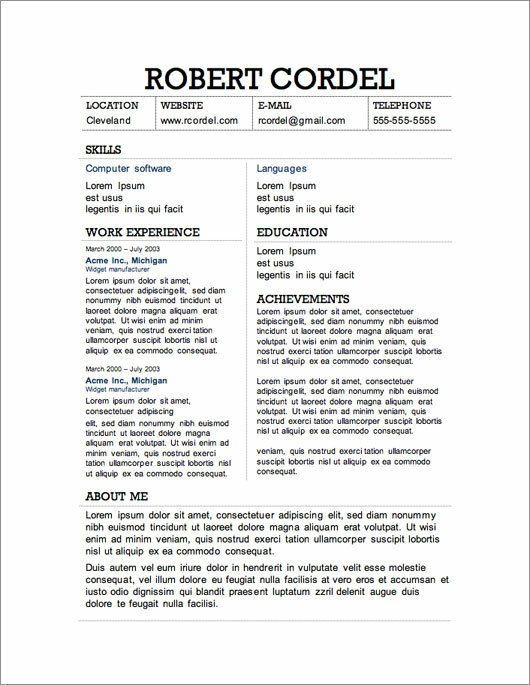 Great list, I am looking for more complex but still creative resume templates like those on http://www.trendyresumes.com or http://www.cvfolio.com but free. Do you know where I could find such templates? Also, they should be for Microsoft Word. Thanks! 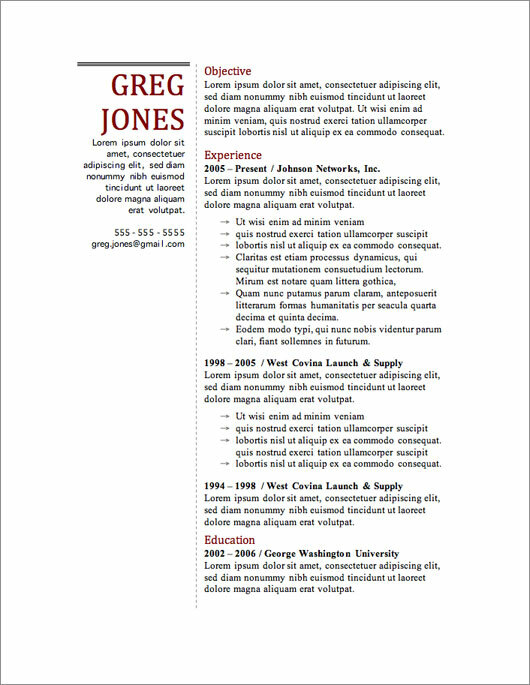 Thank you for the resume template. I used resume 10. For some reason my name, on the side, shows jumbled up when sent through an email and google docs. Is there anyway to prevent this? Thank you. Thanks a million Andrew. You’re a life saving god today & if I ever have to buy anything in the future ,I’ll run to you & recommend you. 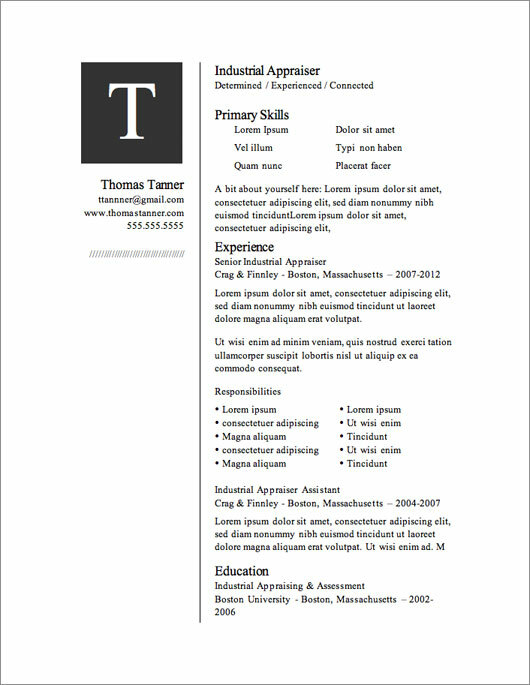 Thank you for this article but if you want your resume to stand out from all the other resumes you need a resume template like this! Nice but need more personal improvement in design, thank you very much! Which template would you recommend for a Director of Development with 16 years experience, some college, currently enrolled in a Leadership Certificate program but no degree? 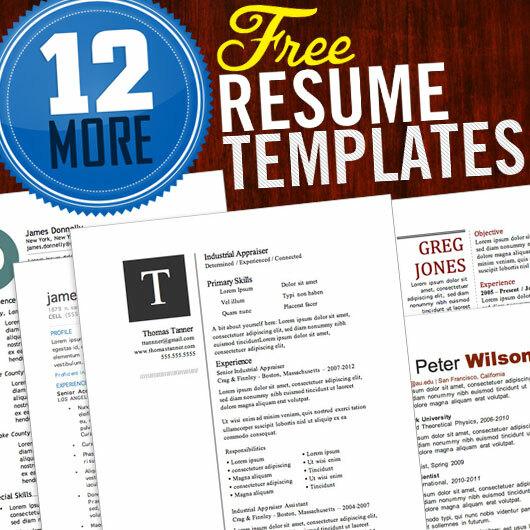 Thank you so much Mr.Andrew for the 12 free Resume Templates.I will take a look at them and see if one of them suits me.Thank you Thank you Sir!!! Great article! Today’s business world is more competitive than it has ever been before, so you need to introduce yourself with an up-to-date, well organized and visual resume.